“In the modern world, the bank success directly depends on how well it knows its customers’ needs and is able to anticipate their expectations. Today, it is especially important for clients to receive services quickly, conveniently and simply — anytime and anywhere,” said Mariam Gogia, Head of Cards and Payments of the Georgian Liberty bank, during a visit to the Vilnius Penki kontinentai office. 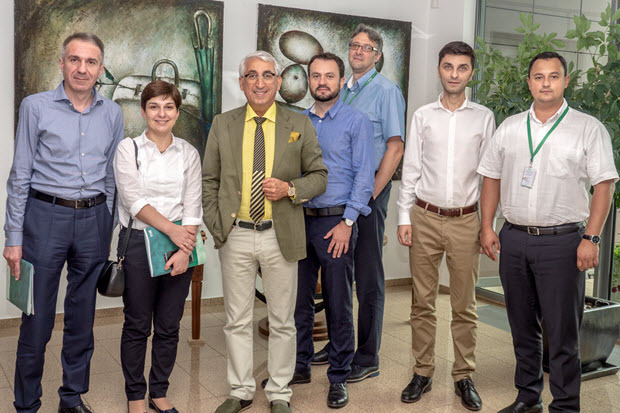 The Liberty Deputy General Director Levan Lekishvili and Emilio Kiris, the Commercial Director of the Penki kontinentai subsidiary — BS/2 Georgia, also visited the Lithuanian company. The Penki kontinentai guests paid special attention to banking equipment and software solutions that provide not only the highest quality of services and speed up the customer service process, but also become an additional sales channel and offer customers the newest services. BS/2 representatives acquainted guests with the .iQ family of software products, multifunctional terminal VTM.iQ, which can replace the bank branch, as well as with other innovative self-service devices. The group of companies Penki kontinentai has been developing business relations with Georgia since 2001. In 2009, a subsidiary company BS/2 Georgia was established, which cooperates with the majority of Georgian state and commercial banks. BS/2 Georgia supplies banking equipment, installs developed software solutions, and provides technical and software services, consults and educates employees. Liberty bank is among the most reliable partners of BS/2 Georgia. It is one of the three largest commercial banks in Georgia with the largest number of branches throughout the country.